This durable castrator was designed for the cost-conscious producer. 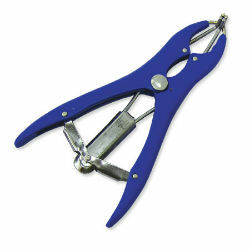 It can be used for castrating lambs, calves, goats, and other animals quickly and easily. No open wounds. Designed for one man operation. Plastic handles with aluminum prongs Bands sold separately.